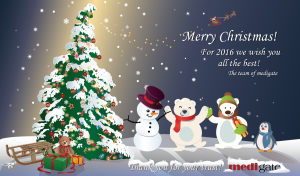 medigate wishes you a Merry Christmas! The end of the year is coming closer, and before that everybody enjoys the Christmas holidays. For this reason medigate also looked back on the last year. For our team 2015 was exciting and instructive and we had to face many challenges. We learned a lot from these and will try to do an even better job next year. Our team also thought about some New Year’s resolutions and found a suitable one for us: to help more students fulfill their dream to study medicine and support them on their journey during their stay in Bulgaria. To our students: We want to thank all of you for your trust and wish you relaxing holidays with your families. Furthermore we wish you a happy New Year in which we all will have to face new challenges. We are looking forward to working together with many students in 2016. Along these lines: Merry Christmas!